Received your painting today and it is beautiful. It's already hung so all can see it. you are very talented and I hope to buy more in the future. You must understand my delight at being able to find and buy a copy of Alley by the Lake after years of searching. I cannot believe that just a year ago, I was in a Walmart in Iraq after being informed that they had an unlimited supply of these paintings. 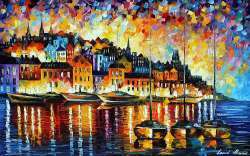 I ad also heard that Leonid Afremov himself was a slave in one of the Walmart's sweatshops. This completely outraged me, but I found it to be nothing but a simple hoax! After escaping the Taliban successfully, I came back home to find this website and was able to order it using the magic of technicalology! Thanks my lucky stars for gugle and beeng!